Real Madrid have identified Carlos Tevez and Angel Di Maria as two of their primary transfer targets according to reports in Argentina. 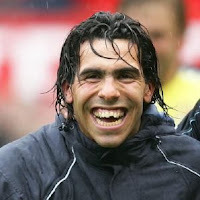 Tevez has been linked with Madrid ever since Ruud van Nistelrooy was ruled out for the season with a knee injury, but despite Spanish claims that he will join Los Blancos in January, it seems more likely that he will move to the Bernabeu at the end of the season. Manchester United have until the 31st January to take up their €39million option on the 24 year old, but with Dimitar Berbatov and Wayne Rooney in front of him in the Old Trafford pecking order, Tevez could see a move to Madrid as an ideal opportunity to respark his European career. His agent Adrián Ruocco is already sounding out Madrid and other potentially interested clubs, but a January move may be scuppered by the fact that Tevez would be cup-tied from playing in the Champions League by virtue of his appearances for United so far this season. Such a reason would not block Di Maria's path to the Bernabeu at the turn of the year, although Benfica are thought to be keen to hold onto the highly-rated wide-man until the end of the season if possible. Benfica's Spanish coach Quique Sanchez Flores is tracking Getafe trio Roberto Soldado, Juan Ángel Albín and Ikechukwu Uche, and would only let Di Maria leave if he was able to purchase one of them in January. Di Maria's stock has risen since his move to Benfica at the start of last season, with excellent performances at club level and in Argentina's successful Olympic campaign solidifying his reputation as one of world football's most promising players.